There is a piece of music running through my head, and I do not want to write this blog post. In the early 80s, probably 1983, I ordered a pre-bundled set of Newbery Award winners for the media center at East Coweta High School, because the collection I had inherited in 1980 was particularly weak on fiction. 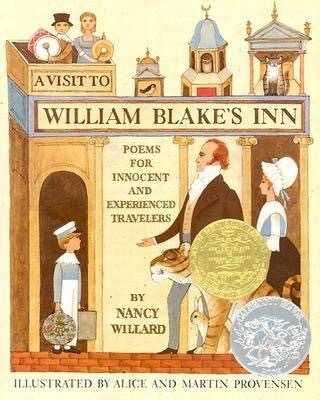 One of the titles that I pulled from that box was the 1982 winner, A Visit to William Blake’s Inn, by Nancy Willard. I was a little nonplussed. This was a picture book. Surely the Newbery committee had made a mistake. Then I opened it. Then I started to read it. Fire, you handsome creature, shine. be the home that warms us all. every corner’s cold but yours. all these little pilgrims warm. and toast their toes, in praise of fire. Fast forward to 2002, when I was retiring as artistic director of the Newnan Community Theatre Company. Having decided to go out in a blaze of glory, I translated The Marriage of Figaro, which was every bit as hard to pull off as you might imagine, so when my lovely first wife came home from her book club to say that Bette had a project she wanted me to work on, I snapped, “Not until November 10!”, which I repeated to Bette herself when she immediately launched into her pitch the next time we met. The project was to audition/train/accompany a dozen young people, ages 8–13, to an international get-together in our sister city of Ayr, Scotland. Other than airfare, all expenses would be paid. Well, OK, sure, why not? The deal was that the Scottish Opera had this little touring thing, two adult singers and as many children as you could cram onstage, based on their national poem, “Tam O’Shanter,” by Robbie Burns. They had premiered it the year before, and Ayr was inviting all its sister cities to send kids to take part in it again. We were there with students from Norway, Germany, and of course Scotland. It was huge fun. On the plane home, the adults in the party decided that Newnan could do the same thing, invite all our new friends to the U.S. to perform in some unidentified work. I remembered William Blake’s Inn. I opened my laptop, put on my headphones, and gave it a listen. Hm, I thought, not bad. When we got back home, we had a meeting of the interested adults and I played for them the pieces I had. They liked it. Let’s do it. But that meant I had to ask Nancy Willard for her permission. I printed out the songs I had, made a CD of the fairly shabby MIDI realizations, and wrote a letter pleading for permission—or at the very least, hope that she wouldn’t sic her lawyers on me. A couple of weeks later, there was email. nawillard@vassar.edu. I stopped breathing. I may have cried. I opened it. gift appeared in the mail today–all those songs! And that’s how I became friends with Nancy Willard. 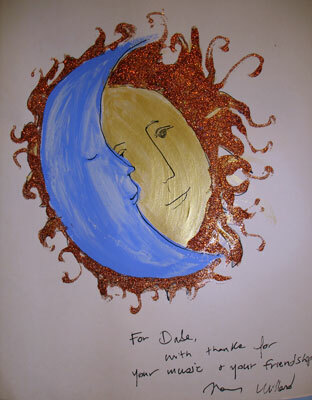 It took me another couple of years to finish setting all the poems to music, and then I had to orchestrate it, so it was not until 2007 that we felt we were ready to put it front of the public. The whole time Nancy was generous and encouraging. And then we met her! 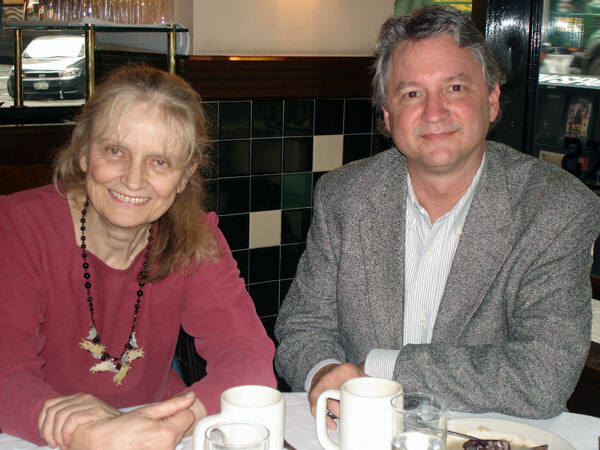 We had gone to New York and I emailed Nancy to see if she and Eric Lindbloom, her husband, could come down from Poughkeepsie to have lunch. They did, and she was exactly in person the way she was in correspondence and in all the videos and interviews I had seen of her: funny, kind, super-smart. We discovered many shared habits, including that of writing ABORTIVE ATTEMPTS at the top of new work (she used the term WASTED EFFORTS). Finally, as we were parting, I pulled out the two copies of William Blake’s Inn, my original paperback and the hardback I had bought to put on display whenever we performed (so that I didn’t risk losing the copy I had composed from). Oh, she said, she’d have to take them with her. My heart sank. What if I never got them back? But no: she needed to take them home with her because she didn’t just autograph them. She painted in them. Finally, on May 3, 2007, we had a “backers audition,” where my intrepid group of volunteers sang the whole work, with what we called a “cardboard and hot glue” staging of “The Man in the Marmalade Hat Arrives” and “Two Sunflowers Move Into the Yellow Room.” The idea was to get a commitment from various individuals/organizations in the community to actually stage the work for the international thing. Everyone loved the music. No one stepped up to take on the project. I will be honest: perhaps I could have done what I always do, which is to just do it all myself. But I refused. For one thing, I had a son in college; I didn’t have the cash to throw at the project (like I did with Figaro just to get it done right). For another, I was tired of all these “supporters of the arts” not actually supporting any arts. I was resentful. So we just put it on the back burner, where it has stayed. Through the years, I’ve made a few feeble efforts: a friend gave it to the Lookingglass Theatre in Chicago, who passed it on to the Chicago Children’s Theatre, who passed it on to the Chicago Symphony, where I’m sure it was discarded. I’ve offered it to UGA, to the Springer, to the Center for Puppetry Arts. But no one’s interested. It’s too short (40+ min) for a mainstage show, and too complicated for a children’s piece. It was written as a song cycle for adult singers. It can’t really be done with just a piano; the later pieces were written for orchestra without going through the piano first. There is no script, no plot; whoever did it would have to do an enormous amount of development to flesh it out—which I think is the most interesting part about it. But I know it’s not an out-of-the-box piece. Then a couple of months ago I got an email from a teacher in Idaho. I-DA-HO, KENNETH. Could her small charter school perform William Blake’s Inn? I wrote Nancy to tell her. And then I wrote her again last month to remind her that although she had always demurred at discussing financial arrangements for when those huge royalty checks started pouring in, I was reminding her that I had decreed that we would make it a 60/40 split. I got a letter, dated Feb 18, from Eric. Nancy was resting comfortably, still at home, but in hospice care. Nancy Willard died the following day, Feb 19, 2017. Part of my grief at losing her is that we never staged the work completely. I never staged the work completely. We never got to have her as a guest at the dazzling international premiere so that she could receive the tribute that she certainly deserved. I’m angry at the world, I’m angry at Newnan, I’m angry with myself. I failed my friend. Now students at Moscow Charter School, in Moscow, ID, will be performing William Blake’s Inn in May. Are they capable of doing a fully staged production with orchestra? 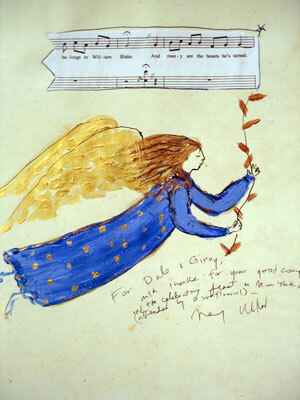 No, but here’s what I learned from Nancy Willard: if you’re given the gift, you give it again. Just as I was given the chance to create something new and beautiful from Nancy’s deeply meaningful poems, I look forward to seeing what those students come up with. I’m hoping to work with them via Skype to bring their ideas to life. We’ll start our journey as children,/but I fear we will finish it old. Now “Blake Leads a Walk on the Milky Way,” the great central piece of the entire work, won’t leave my head. Those opening chords, which return to such great effect in the “Epilogue,” keep up their chime, and the recapitulation at He gave silver stars to the Rabbit, with its unexpected and gorgeous major key take on the mysterious first theme—they’re on permanent loop, reminding me of the beautiful beautiful soul who gave me permission to create them. I know that if I listen too carefully, I will grieve outright. I’m okay with that. My predecessor had righteously sniffed that a liberrary was for research. If the chillren wanted to read for fun, they could do that at home. The fact that most of our clientele came from homes without books seemed to be irrelevant to this woman. What made me think we could even do such a thing? A hugger-mugger performance of Green Eggs & Ham at a Reading several years previously—I stole the joyous ending of the piece from the Act II finale of Figaro. I’ll explain some other time. Her resistance to business dealings was extraordinary. In her original email she pointed me to the rights department at Harcourt, the publisher of A Visit to William Blake’s Inn, where they explained to me that they didn’t own the copyright—she did.